The above quote so eloquently penned by 16th Centrury Italian poet, author and artist Pietro Aretino is as true today as it ever was. While our Artists were in hibernation working on their latest creations of genius, it allowed the perfect time to re-launch our new website and social media sites for Friendly Folk Records. Special thanks go out to Niilo Sirola of Greenrose Faire for designing our new seahorse logo. Also, we would like to say thank you to all of the faithful fans out there who continued to follow us to our new internet addresses. Please make a notation of our new addresses at the end of this post. We worked briefly with a music distribution company in the Netherlands, and we set up our websites and emails on their 'free' Wordpress account. Sadly, they changed passwords on our accounts in October and routed our emails to their own record labels. Since January/2018 we are officially no longer associated with any services provided by Indieplant nor Indieplant CD Perserij. 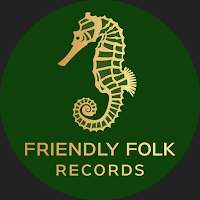 They are obligated to delete all references to Friendly Folk Records from their websites and promotions, it is taking much longer than anticipated for them to do so. Please beware that Indieplant utilizes several automated robot emails to send out spam advertisements. If you receive any spam emails from these unauthorized robots, please disregard the message as they are not on our behalf. After six months our Artists requested that we find new alliances for our distribution services. February was a busy month for demo-drops and signing new Artists to both our record label and My Music Matters-MT for promotion and management support. We are very excited to welcome a dynamic duo cover-band from Rotterdam, The Rodeo Roses (NL) who have signed on with My Music Matters-MT for promotion services. Max Bianco (UK), signed a multi-deal contract with both agencies. Read about the Artists on their profile page by clicking on their name. You can see both acts live at Cranenburgh Events. Greenrose Faire (Finland) released 'A Decade of Songs and Stories' physical cd several months ago, and it is now available via our SHOP, and via our new distribution service you can order the album from worldwide web-stores for immediate delivery. We also encourage you to download a copy of the digital single found on this album, 'Cold Winds Are Rising'. Tone Fish (Germany) released their digital single, 'The Traveller' via Friendly Folk Records and our new distribution services, DMW. It is available on all worldwide digital platforms. The Royal Spuds (Netherlands) released their digital single, 'A Man' via Friendly Folk Records and our distribution service, DMW. Available on all worldwide digital platforms. Drusuna (Portugal) released their digital EP 'Kaytos Kom' via Friendly Folk Records and our distribution service, DMW. The physical EP is available via our SHOP, and via you can order the album from worldwide web-stores for immediate delivery.